THE BERLIN WALL: The Berlin Wall was a wall in Berlin, Germany that separated Communist East Berlin from democratic West Berlin. It was one of the most visible symbols of the Iron Curtain. The wall was built in 1961 by the government of the German Democratic Republic (East Germany) to stop the tide of emigration to West Berlin. (by the New York Post Editorial Board) – This week marked a historical milestone: The Berlin Wall, once the world’s most notorious physical symbol of repression, has now been gone longer than it was up. An entire generation no longer remembers the 96-mile barrier, hastily erected by Soviet-controlled East Germany in 1961 to halt the flight of [East Berliners to democratic West Berlin]. The wall’s initial bricks soon gave way to mammoth concrete barriers, laced with mines and patrolled by soldiers under orders to shoot anything that approached it. During the 10,316 days during which it stood as an ugly eyesore of oppression, thousands of desperate East Berliners tried to cross it — climbing, tunneling or bribing their way. As many as 300 died trying. Over the decades, Washington was unable to do much but express solidarity with those yearning for freedom, most memorably in President John F. Kennedy’s soaring declaration: Ich bin ein Berliner. It took another two years and a series of public uprisings across Eastern Europe before the wall was finally declared open on Nov. 9, 1989. Within days, most of it had been demolished. Months later, Germany was unified for the first time since WWII. For 28 years, the Wall told Berliners there was no hope. The past 28 years have sent another message — that hope is never lost and freedom ultimately will triumph. Published February 8, 2018 at The New York Post. Reprinted here for educational purposes only. 1. The purpose of an editorial/commentary is to explain, persuade, warn, criticize, answer, entertain, praise or inspire. What do you think is the purpose of this editorial? Explain your answer. 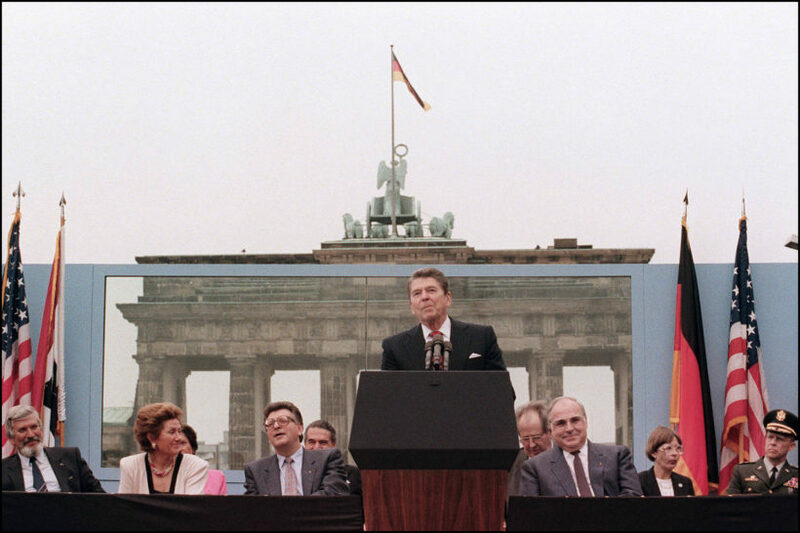 OPTIONAL: Watch President Ronald Reagan’s 1987 speech at the Brandenberg Gate in Germany. What is Checkpoint Charlie in Germany? Haus am Checkpoint Charlie, also known as Mauermuseum, is a collection of photos, stories, and miscellaneous items documenting the damage the wall had caused.